The next president will take office during a period of rapid market and regulatory change for the U.S. electricity sector. Due to statutory deadlines, pending lawsuits, and agency rulemakings—if not by choice—the next president will tackle energy policy. 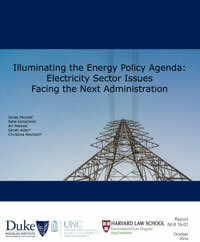 To prepare policy makers for what promises to be a dynamic period in electricity law and policy, this report provides an overview of each of six key areas of federal policy and, for each area, identifies the decision points—in time or circumstances—that will force the next administration to make choices that shape the future of the grid. For each decision point, the report explores the next president’s options and the federal agencies and authorities that he or she could deploy.